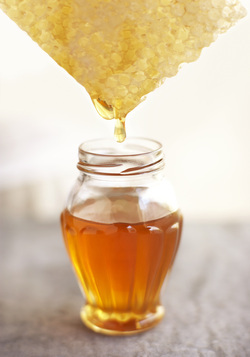 (link A small informal style club to meet and talk about bees, honey & beekeeping. Topics are ad lib. Please check EVENTS for dates.
. This bill is needed in New York to protect the image of honey and to assure the consumer that when a jar reads "Pure Honey" it is real honey not "Funny Honey". This is a serious issue that will affect all NYS beekeepers. Unfortunately few beekeepers are aware of the undertaking to reinstate mandatory registration (which was repealed in 2010), and that most beekeepers are being kept woefully uninformed and is some instances misinformed. What many would like to see is for the State of New York to provide services for all beekeepers, with no strings attached, and release information about disease info, spraying, and other programs which may affect honey bees such as tick control measures using pesticides-- all info which Albany possesses. There is a website with an online petition, press articles, Q&A page, comments page, and contact info for your representatives. 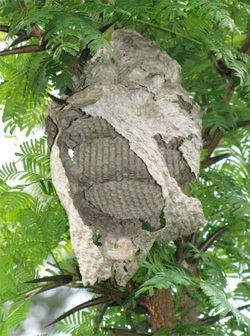 During the summer and early autumn, wasps will build large papery, grayish nests. Unfortunately beekeepers are not interested in collecting these. Wasps are enemies to honey bees and sometimes will invade bee colonies to kill and rob. Contact an exterminator or follow directions on wasp spray containers. *Do you have Spring bees on your lawn or yard? - you may have mining bees (link). A youtube video taken by a homeowner with a bee swarm outside his front door! Generally a bee colony will send out a queen and bees to find a new home. This is their way of creating a new colony. The bees will alight on a branch or other place for only a few hours or days. They then leave to a more sheltered permanent place such as a hollow tree, abandoned building, house soffit, and so on. 2) Do not spray with pesticides or water, as this may kill the Queen and other bees. 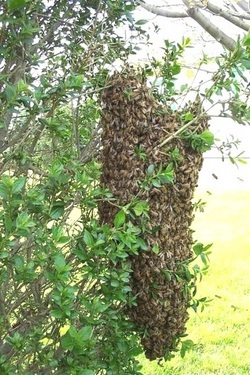 3) A fresh bee swarm usually will not sting as they are concerned with moving to a new home. a) how high the swarm is, what is it on? b) How long has it been there? c) How big is it? basketball size, watermelon size?